My Two Blessings: TLC Book Tour: Before I Go To Sleep by S.J. Watson + giveaway. TLC Book Tour: Before I Go To Sleep by S.J. Watson + giveaway. Synopsis: " A terrible accident has robbed Christine of her memories. She cannot remember the past--or even yesterday. Determined to discover who she is, she has begun keeping a journal before she goes to sleep. Before she can forget again. But the truth may be more terrifying--and deadlier--than she bargained for..."
Imagine waking up in the morning and not recognizing the place or the man next to you in bed The panic, the oh my god, where am I, what have I done. Sneaking into the bathroom and being unable to recognize the face looking back at you from the mirror. Face wrinkled, hair short and my hands. Old, wrinkled, veiny. The panic. Then you see, pictures taped around the edges of the mirror. One that says your name, Christine. Another pointing at the the picture of the man you woke up with - his name, Ben. The words your husband with an arrow pointing at him. Going back out into the bedroom to face the stranger in the bed. Thus starts Christine's day, her calm patient husband explaining to her once again about the accident that damaged her long term memory. He walks her through the house, shows her the white board in the kitchen with notes of things to do, phone numbers to reach him while he's at work. A thin scrap book of pictures of their life. She receives a phone call from a Doctor Nash, her doctor, who tells her she's been seeing him behind Ben's back because Ben has giving up all hope of her recovering her memory. They have an appointment which is written in her diary in her purse. She's afraid but agrees to meet him. He returns her journal to her, full of weeks of notes she had written. He had told her to write, to keep track of her days, to help her remember. "I feel nervous, I do not know what this book will contain. What shocks and surprises. What mysteries. I see the scrapbook on the coffee table. In that book is a version of my past, but one chosen by Ben. Does the book I hold contain another. I open it. The first page is unlined. I have written my name in black ink across its center. CHRISTINE LUCAS. It's a wonder I haven't written PRIVATE! beneath it. Or Keep out! Something has been added. Something unexpected, terrifying. More terrifying than anything else I have seen today. There, beneath my name, in blue ink and capital letters are three words. There is nothing I can do but turn the page. I begin to read my history. S.J. 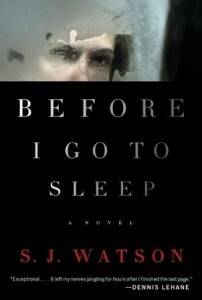 Watson's debut novel Before I Go To Sleep is a psychological thriller that will keep you on the edge of your seat. S.J.Watson tells a story full of mystery and deceit with finger biting, chilling tension. You never quite know what to expect and just when you think you've got it figured out, the story twists in a different direction. I highly recommend it. Thank you to Trish for asking me to be part of the tour, Harper Collins for providing me with a courtesy copy of the book and S.J. Watson for writing such an interesting, convoluted, engaging, unique story. Check out the previous and rest of the tour stops to read other bloggers thoughts about the story. For more information about S.J. Watson or Before I go to Sleep check out the website and facebook. Some interesting news - Ridley Scott’s production company has acquired the rights to the book and will turning it into a movie and filming expected to begin sometime this year. That is definitely one movie I can't wait to see. This book sounds fantastic, and a little bit along the lines of Turn of Mind which I reviewed a few weeks ago. I would love the chance to win this one and read it for myself. Thanks for the very enticing review! I would like a chance to win and read this book. I'm glad you enjoyed this one Robin. It certainly sounds like a book that would keep me reading late in the night.